Retired fisherman Peter Rowe, 79, is one of the 10 Friends vocalists on One And All, the second album from the Cornish band. 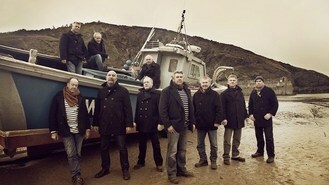 Peter, whose band was spotted by a record company executive during an outdoor singalong in their home village of Port Isaac, said: "I am just delighted to be part of the success of the Fisherman's Friends and thrilled that people want to hear these songs. "I retired as a fisherman in the late 1980s and settled into the quiet life. "But singing with the guys keeps me young and I look forward to celebrating my 80th birthday with the guys next month." Their eponymous debut record sold more than 150,000 copies on their way to becoming the fastest-selling traditional folk act ever. A series of appearances of television commercials followed, as well as a slot on the iconic Pyramid stage at Glastonbury festival in 2011. The tracks were recorded earlier this year, before the death of singer Trevor Grills, who died following an accident at a gig venue in Guildford earlier this year. The latest figures from the Official Charts Company show One And All is currently the 12th best-selling album of the week. Doris Day still holds the title as the oldest solo artist to enter the UK album charts with an album of new material aged 89.